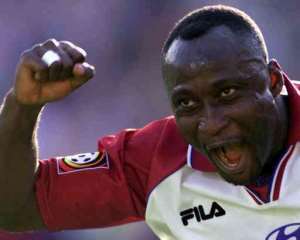 TONY YEBOAH, arguably one of the greatest strikers Ghana has ever produced was over the weekend honored with scoring ''Leeds' Greatest Goal'' by the London Club, Leeds United. Yeboah, 37, joined Leeds from Eintracht Frankfurt for 3.4m pounds nine years ago and was sold to Hamburg for 1.5m pounds in September 1997, after making 65 appearances and scoring 35 goals. Supporters voted for the 100 Greatest Leeds Goals of all time on Leedsunited.com and the results were made public at a special awards ceremony at Elland Road on Sunday evening.